Dermalian Earth personnel: The crew scanning the New York Public Library are a Dermalian Librarian wearing a layer of memory Plasma with an inner layer of brain next to the body on one side and an outer layer of sensory nodes (touch, sight, sound) on the other side and a Human Dermalian Creative wearing a suit made of memory Plasma. The Librarian is the Captain of the excavation; he has not been able to learn to speak human language in his Dermalian form and has to morph a human head in order to communicate with the Human Librarian. At the time of their first communication, the Captain's human hair is standing on end all over his head and he is concerned about the project staying on schedule because it is monsoon season in New York as a result of global warming on Earth; and lightning crashes the memory Plasma, so he and his crewmate cannot scan until the storms end. 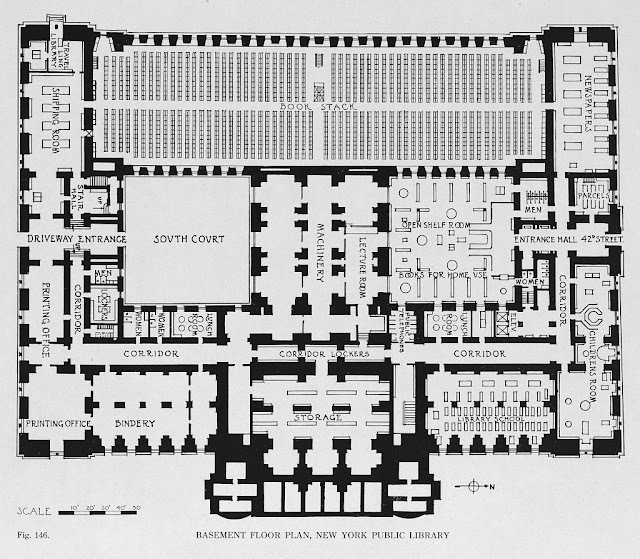 Basement Floor Plan, New York Public Library Originally saved from the Library of Congress. I am sketching scene summaries; and I thought of the first in-flight communication between the Space Bubble pilot en route to Earth and the team of archaeologists who are on Earth completing their scans of the NYPL before it is encased in Plasma that was developed for preservation of the NYPL. The Dermalians, rather than excavating and removing the NYPL so that it can be reconstructed in a protective environment on their home planet, instead, as their archaeological protocols require, are scanning the site so that they can create a full sized replica of it. I realized I still didn't have a sense of place for the archaeologists and went looking for a diagram as a place to start creating "ruins" in my mind. My first experiment showing the reciprocal altruism fundamental to DERMALIAN culture between Dermalians and their environmental Plasma. The function of an empathic Creative aboard a small crew space bubble (http://dermalian.blogspot.com/2018/02/solved-fitting-spaceship-inside-one.html; https://dermalian.blogspot.com/2018/02/dermalian-by-sylvia-toy-story.html) includes taking care of the Plasma (https://dermalian.blogspot.com/2018/03/dermalian-by-sylvia-toy-plasma2-2018.html). In order to accomplish this, the Creative who usually wears a Human body, transforms part of her body to Plasma-like tissue that best enables her to provide the nurturing that the Plasma needs to stay health. Her anatomical changes allow her to partially merge and interact directly with the Plasma. Stumbled upon in research: FAA "Human Space Flight Checklist"
I have begun applying for grants so that I can hire and train actors for DERMALIAN and other projects. If my luck is so bad that I don’t win any grants, I may have to play both The Librarian and The Creative characters so that I can afford to hire a classical stage actor to play The Zombie Shakespearean. A note about The Zombie Shakespearean: Before I had the greenscreening depth perception that I have now, I pictured shooting The Shakespearean in a studio with catwalks so that as the character wanders the world of the story (which now is inside a space bubbleship), he appears at different elevations. Issue number one of course is the safety of the actor; so I am back at the drawing board trying to figure out to show The Shakespearean wafting through the space bubble at different levels.